I’m a relatively new convert to Seanan McGuire’s writing, though I’ve mostly read the work she’s written under the name “Mira Grant.” One of the things that has attracted me to her writing is the constant sense of ‘newness’ she presents. Her works are fresh and she somehow manages to present an idea that seems as though it has never been done before. In this novella, the story revolves around Eleanor West’s Home for Wayward Children. This is not your average boarding school. This is a school for children who have returned from their various and individual fairylands and need some recovery time. What would it be like for Alice to return from Wonderland, or Lucy from Narnia, or even Max returning from the island of wild things? Is it possible to return to a normal, mundane life after experiencing the fantastic? And so we begin with the arrival of Nancy, a girl who recently visited The Halls of the Dead, where stillness and quiet are valued and she learned to stand still. But Nancy is roomed with Sumi, a girl who is always in motion and for whom, standing still equates to death from the world she visited. While Nancy tries to find time to decompress and understand the world she visited, she also must deal with a lot of other boys and girls who have had similar (but vastly different) experiences. But just when the boarding school itself is making sense to her, a complication arises … murder happens at the school. McGuire has written a beautiful, lyrical tale that pulls in implications of nearly every fantasy written prior to this. But she’s also written a story that speaks directly to the YA audience. These are students, teens, and even though they’ve gotten to experience something that no one else will likely ever experience, they still have to survive the perils of being a teen. There are cliques, there is bullying, there is the taunting and/or acceptance of those with differing sexual leanings. Their life is simply complicated by their unique experiences … just as every teen’s life is unique! I enjoyed the book, the writing, and the way McGuire manages to make something so fantastic (as in fantasy) and at the same time, so personal. What I didn’t need, was the murder. I understand the need to create something dramatic – a conflict in the story – but there is really enough here to build on without this added complication. Looking for a good book? 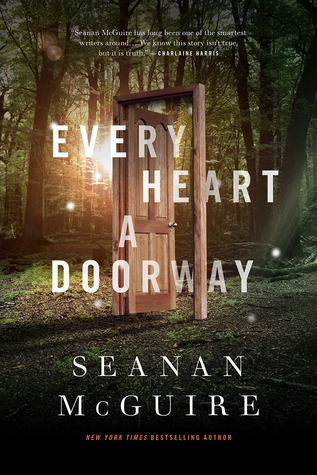 Every Heart a Doorway by Seanan McGuire is a beautiful fantasy very worth reading by a YA audience or anyone interested in good, original story-telling.